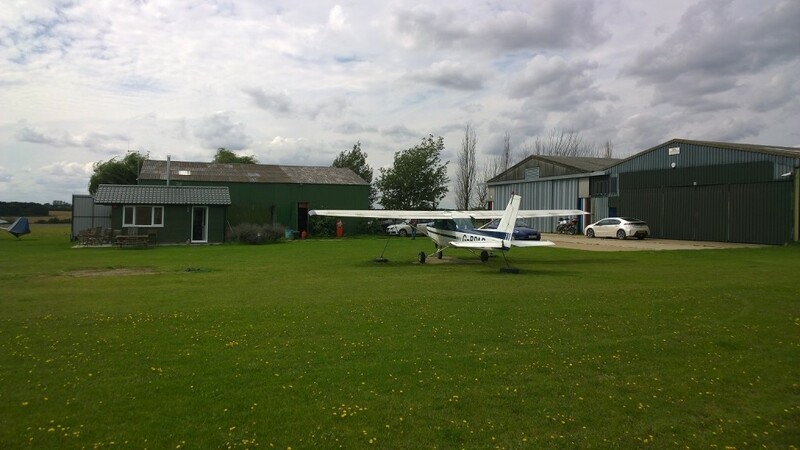 This airfield has been on my ‘want to go’ list for months, a pretty obvious choice being just 20 minutes flight from Cambridge. 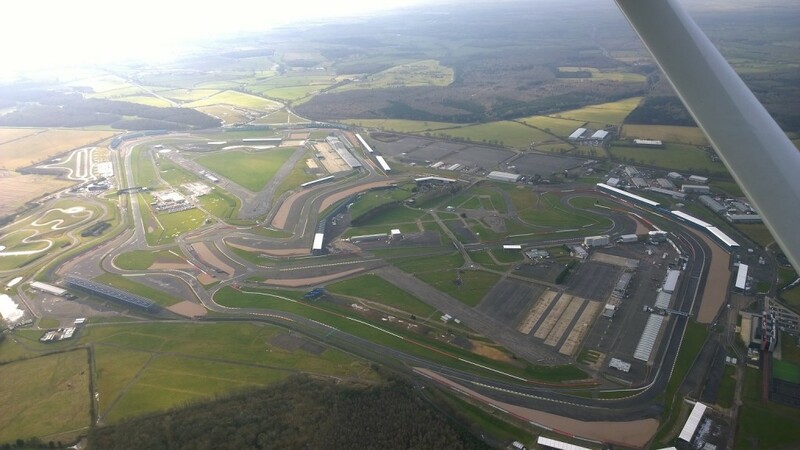 It’s fairly irregular circuit had put me off in the early days post getting my license and then other places came up and all the usual stuff got in the way. A chance catchup online with a friend meant the right seat would be occupied with a local friend. Now I’ve got quite a few hours post-PPL, it’s great to have friends in the plane to chat with and to steal copies of their photos after. No chance of rain…….so why is it raining then? The weather man had spent the last two days religiously reciting “cloudy, but NO CHANCE of rain.” I was a little concerned about the cloud, but being only an 18-20 minute hop by plane, I was pretty sure that worst come to the worst on the cloud we’d be pushed down to 1,500 but we’d get there no worries and maybe it’d cut the return leg short. I was not prepared at all to open the door at 8:45am to find it RAINING! 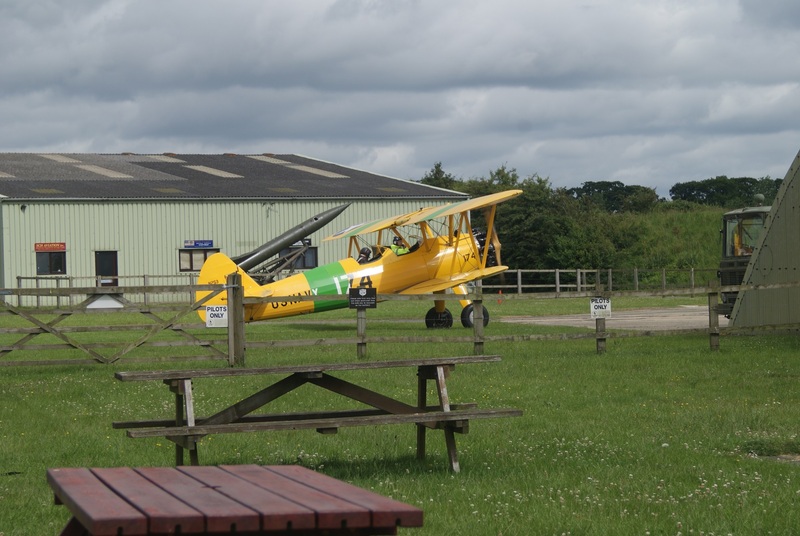 For the true experience of flying light aircraft, spend two hours drinking coffee at your nearest airfield. 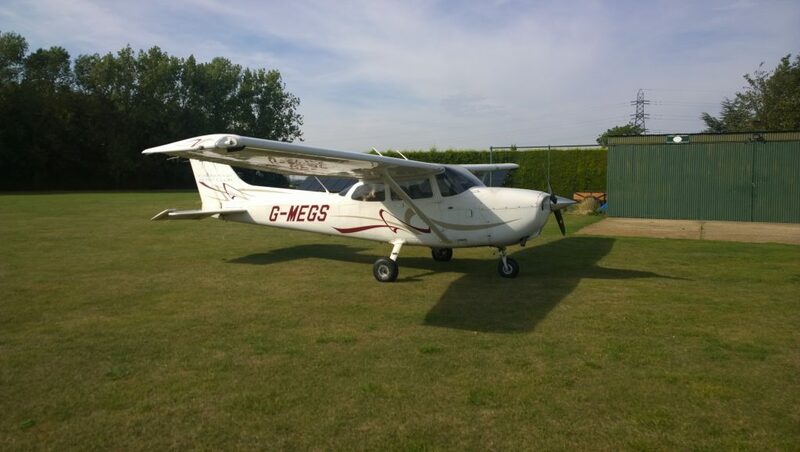 If you don’t have an IMC or Instrument Rating then sooner or later, you will be spending hours of your day, scheduled for flying, sat around an airfield watching the weather and waiting for the clocks to tick past 20 minutes for the latest METAR update. If you don’t like talking planes, looking up at the clouds and anecdotally debating what they’ll do next……don’t bother learning to fly. It’s part of the deal, you’re only buying a few hours a month with the propeller spinning, all of this stuff is free, you have to enjoy it or you’re not going to fully enjoy having a license. 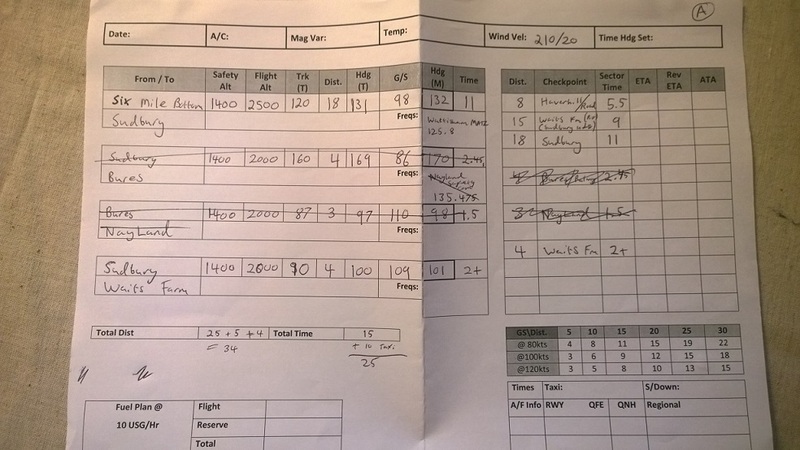 Suffice to say, most pilots I’ve ever met, LOVE talking aeroplanes and what the weather will/won’t do next. On arrival this is all we could do, the cloud base was 1,400ft and at times the visibility was reported as 3Km! Yet I had faith in the day coming off, even the chief instructor reckoned it was going to be a nice day and you can usually take such tips to the bank. There’s only so long you can wait though and after 2 hours and only the beginnings of improvement in the weather it was time to look at the diary and see what else we could do today. Thankfully a solo hire plane was free all day, I couldn’t get MEGS which is the plane I wanted ideally, but one advantage of delaying a few more hours would be that I could then get Whiskey Kilo or Romeo Charlie. 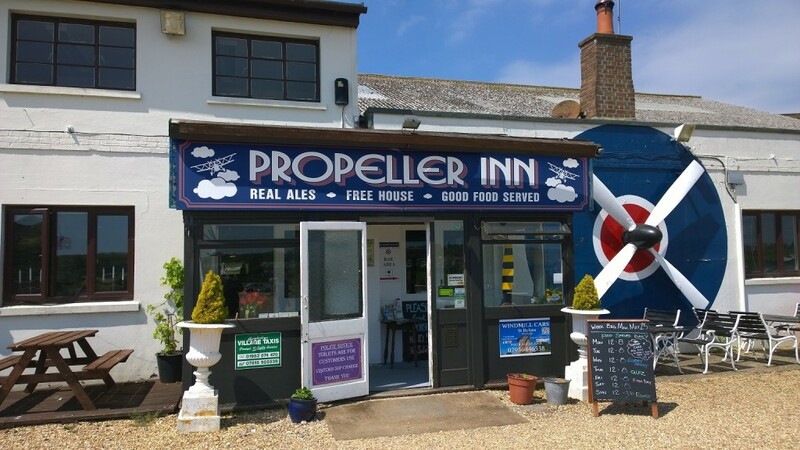 Let’s find a pub that’s open, have some lunch, as it’s nearly 11am, then go flying. The plane was now available until 6pm so this delay wasn’t eating into our allowable flight time and neither me or my passenger had any other plans today. Gave me time to phone Old Buckenhem, get Prior Permission to land there and a chance to get info on the weather, runway in use and local aero traffic. 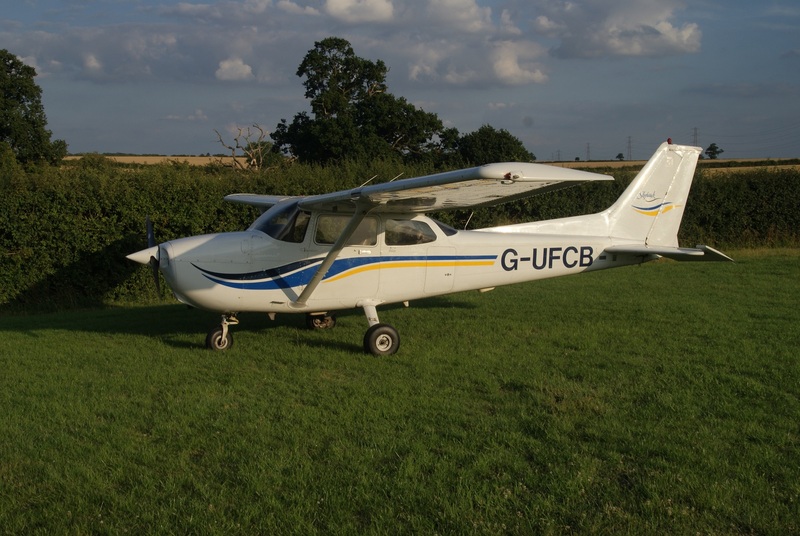 Finally all signed up, lets go flying……. 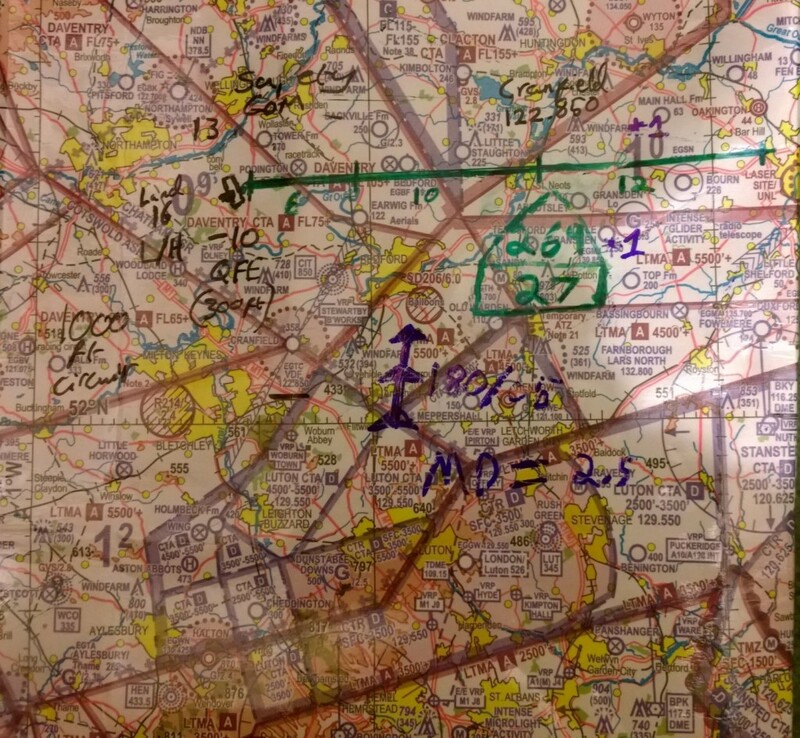 Soooo many signatures & phone calls…….but no ATC form faxed! 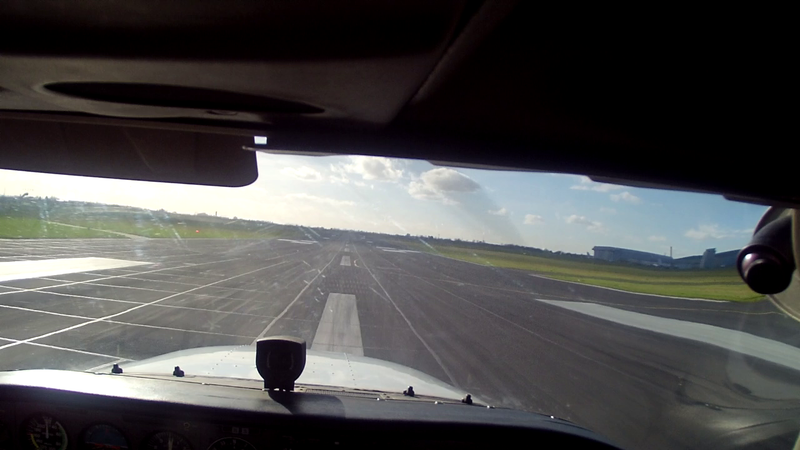 A northerly wind so the long taxi down to holding point Delta, for runway 05 today. 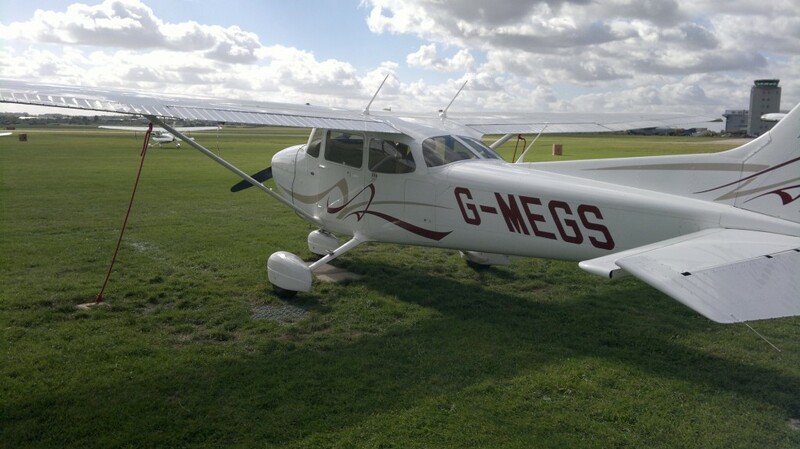 Still I was happy, the flight was on and I got to take G-MEGS out for a spin, recently I’ve found I really enjoy flying this plane. 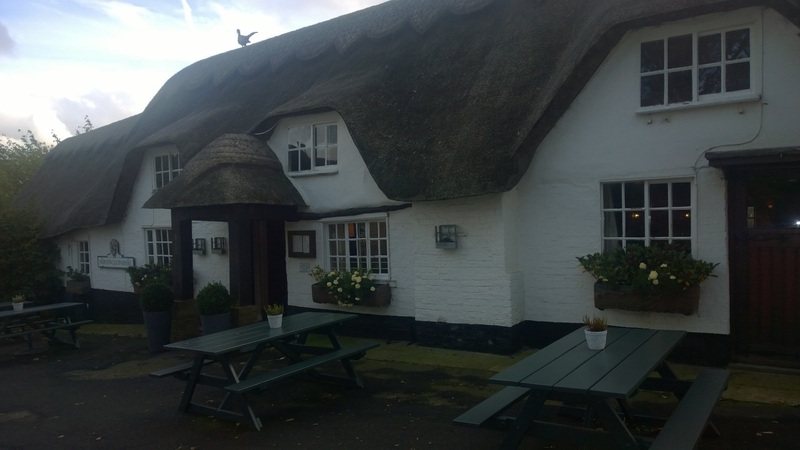 Thetford Forest, Mildenhall, Lakenheath & Honnington. 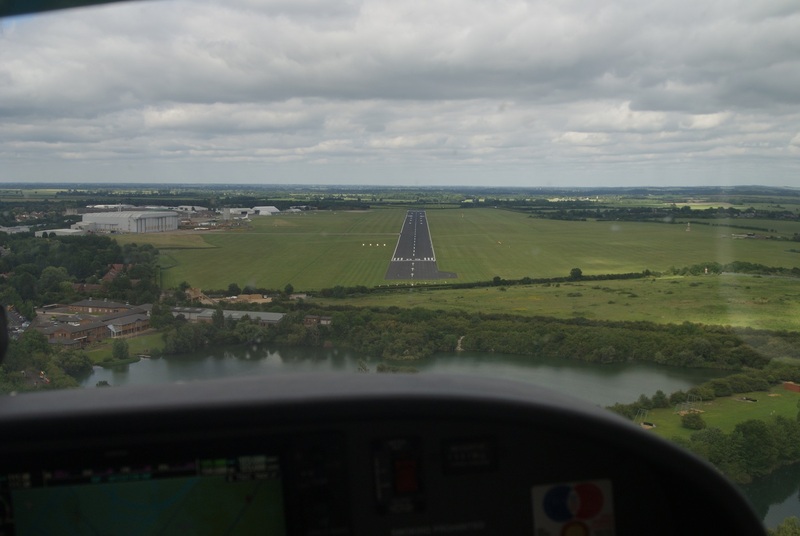 Runway 05 gave one big advantage for this route: We could fly direct to Newmarket and set heading from there, rather than navigate to the standard Nav points. 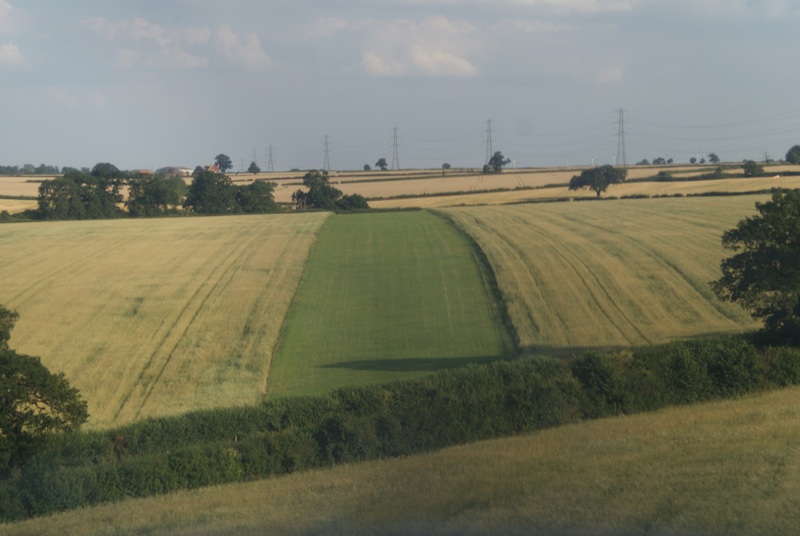 It’s an easy town to spot with its railway, race horse track etc. 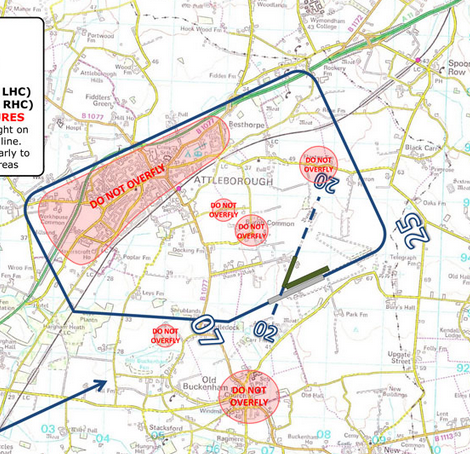 The trick with doing this however, is that it’s also VERY close to Lakenheath/Mildenhall Combined Military Aerodrome Traffic Zone (CMATZ), so you need to be talking to them almost as soon as you’re safely into the climb out of Cambridge. The ATC guys at Cambridge again being great folks today, realized this is what I’d need and offered it up without needing to ask or without any of the messing with calls requesting I contact Cambridge Approach etc. Great stuff could get this done early and get MATZ Penetration clearance from Lakenheath nice and early keeping those guys on-side. 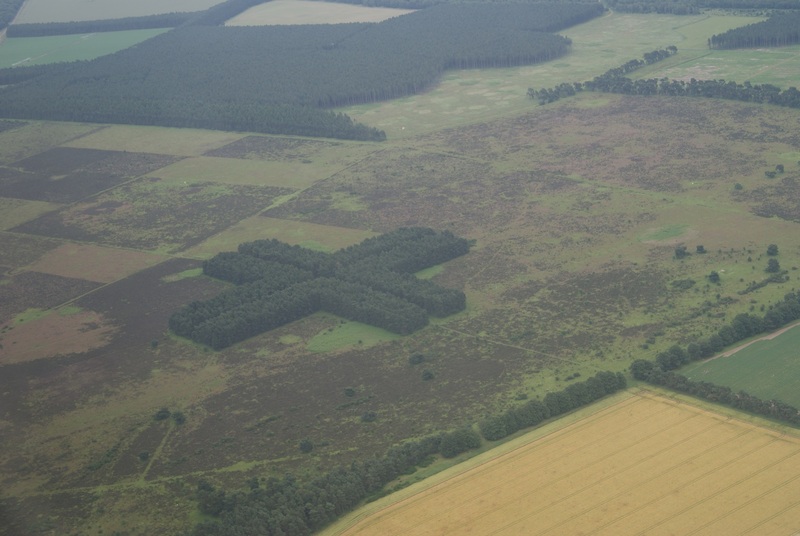 Thetford Forest, Structured from the sky. 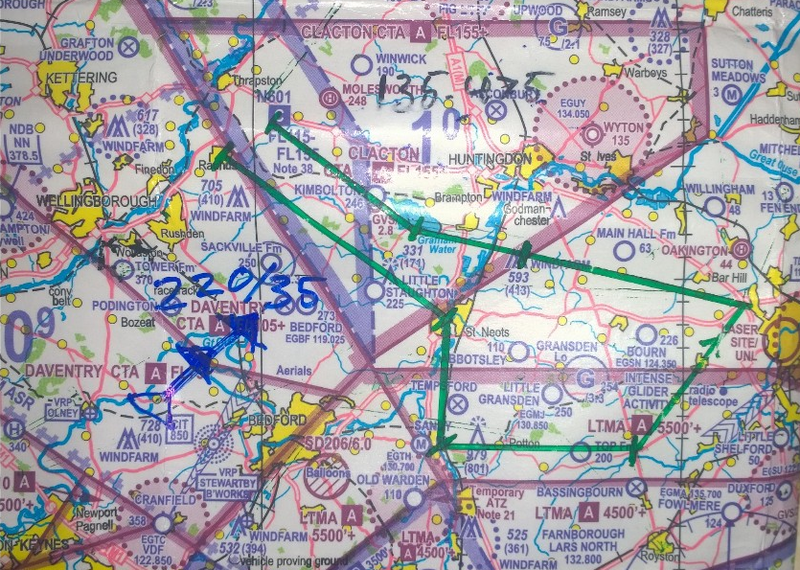 The reason I wanted them to be on-side for this is that the route actually means flying about 4 miles away from their ATZ and with absolutely massive runways at Lakenheath and Mildenhall, within visual of their airfields. 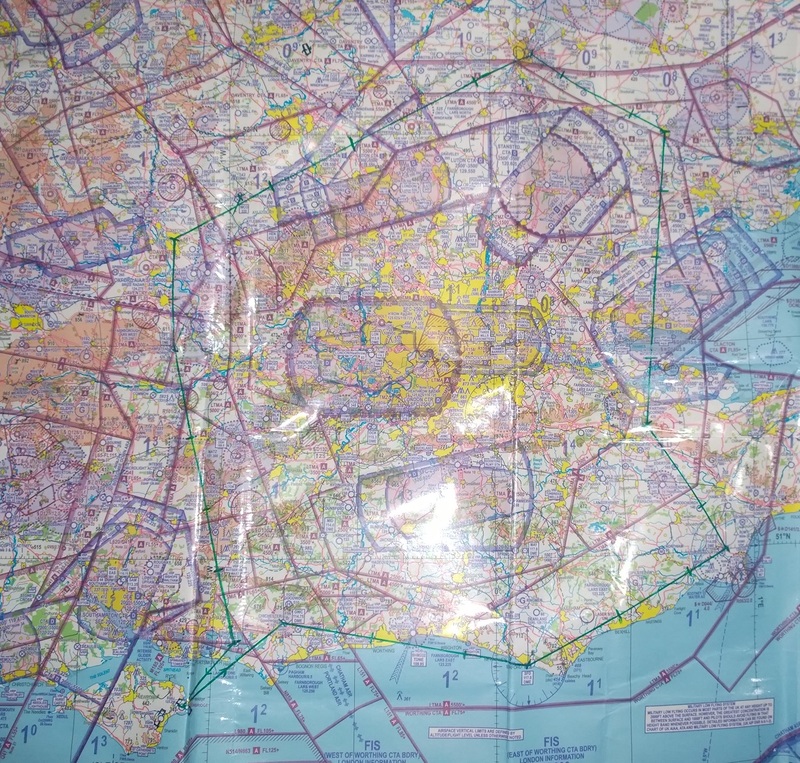 This means you’re not just a passing blip on the radar thats skimming the edge of their zone and no real hassle, if they wanted/planned to launch any fast jets or land any, we’d be a real aggravation for them – and if we didn’t fly exactly the heading we planned, we could become a whole heap of work for them. Thankfully the A11 means you can keep that on your left and be sure you’re not infringing their ATZ. The controller today seemed like he had a fairly quiet day, asked us to squark the usual sort of code for their MATZ and let us get on with our day. 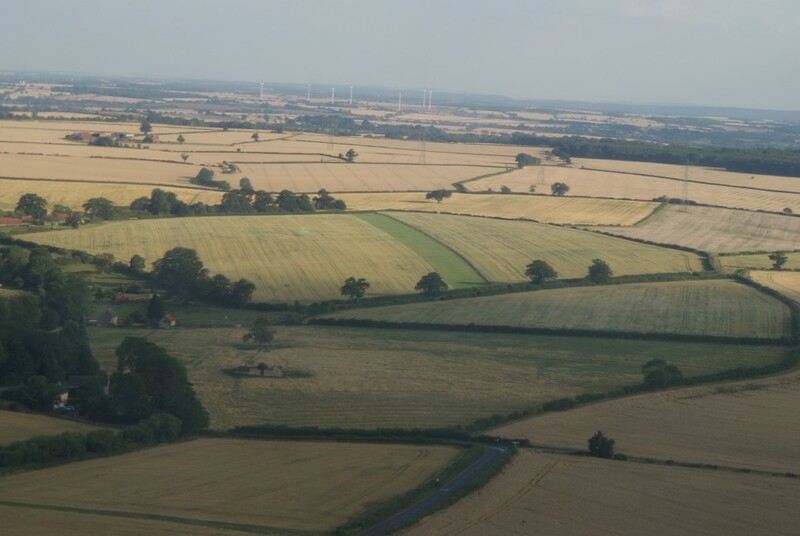 Great views from here, Lakenheath on the left, Thetford forest on our right and dead ahead. 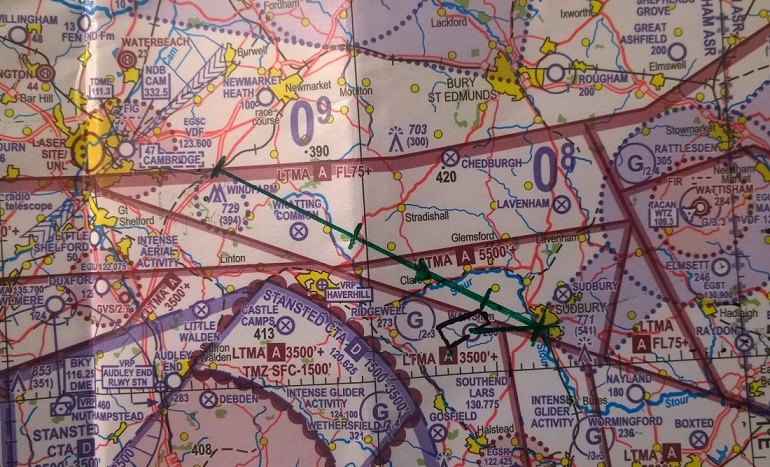 Good stuff, I’d not been down this stretch of airspace since my Solo Nav #2. (where you do this leg in reverse). 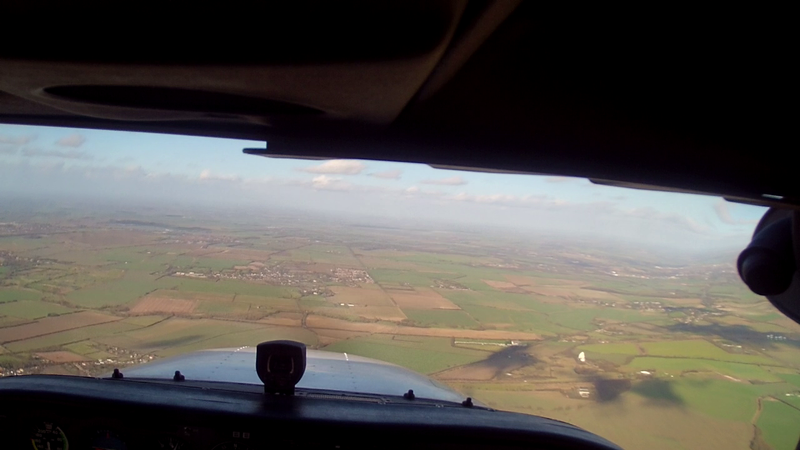 Snetterton and No Straight In Approach today. Old Buck. 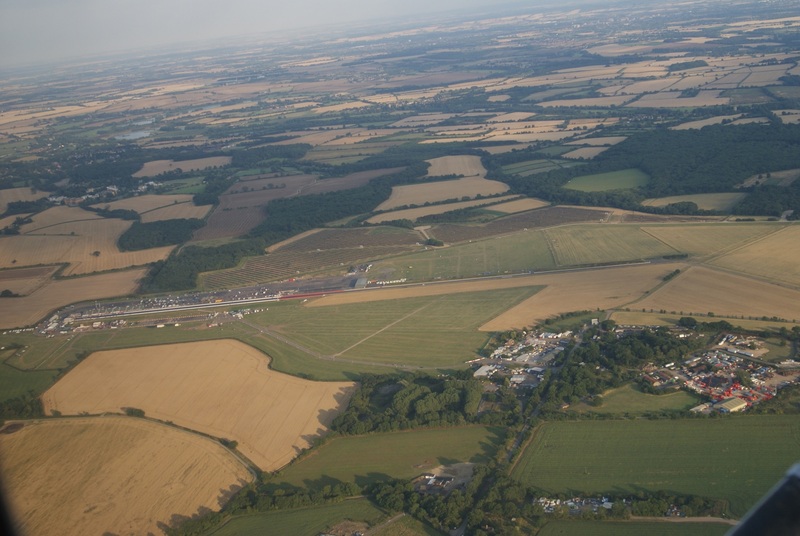 had told us to avoid Snetterton today due to helecopter activity with the motor bike racing they had on today……however the motorbike racing was exactly why I didn’t want to avoid Snetterton. Now before you scream ‘Safety first’ at me, there wasn’t a helicopter in sight and visibility was very good. As with most of these things, I suspect they’re busy at the start and the end with almost nothing hovering in the middle. 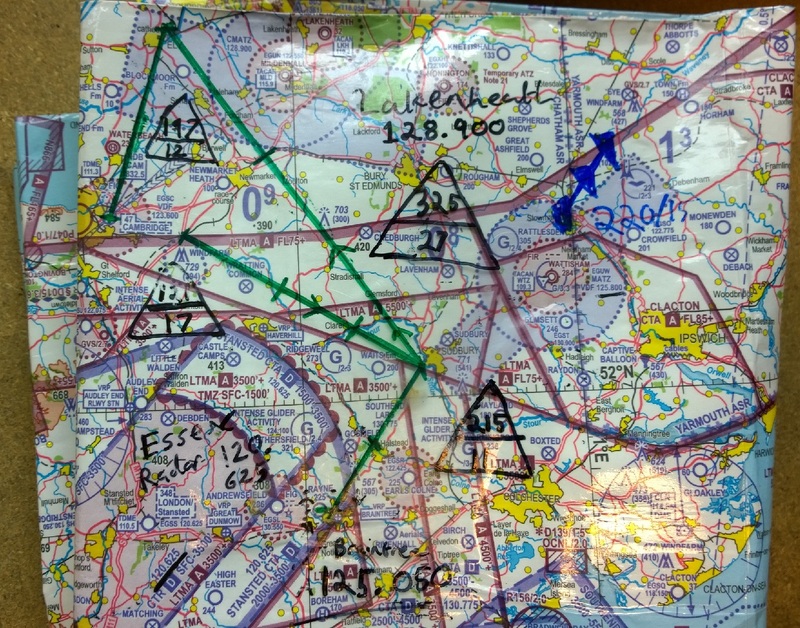 Sadly though Old Bucks wouldn’t give us a straight in approach due to their awareness of activity over Snetterton, instead a left hand circuit, for runway 07 was in use. 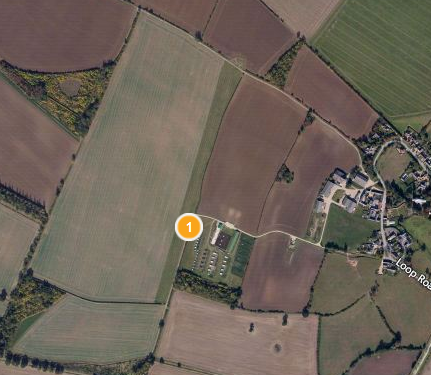 Normally a circuit at your destination is expected, but the circuit at Old Bucks is huge, have a look at the diagram, it’s so big you actually fly into and then back out of, their own ATZ to complete it! 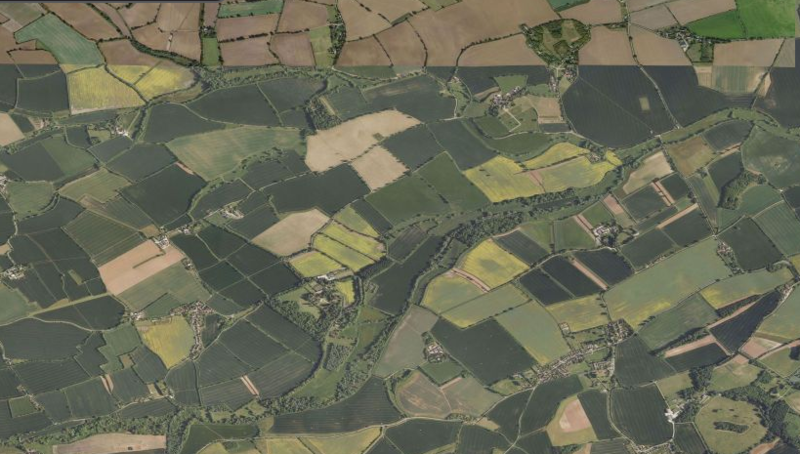 There is very limited information on how to approach Old Bucks from the South West and then do a left hand 07 circuit. 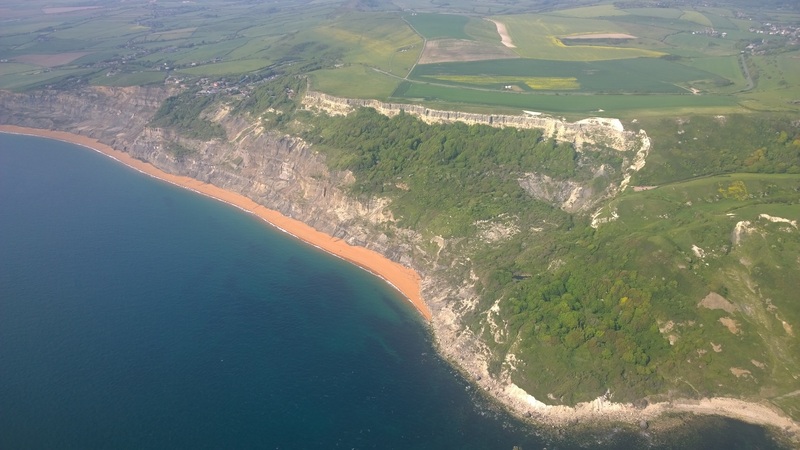 Rather then trying to overhead join at 2,000ft and have all the headaches of positioning that would require from here, I elected to simply descend dead side from an offset straight approach (thus skipping all the overhead turning at 2,000ft that would be required of a standard join). Another plane was turning onto base, my passenger spotted them, 1,000ft below and on our left. So visual with them, I began the descent to circuit height. Things now got interesting, the other plane wasn’t coming in to land, but instead to touch-n-go!! The risk now that they’d begin to climb out up to 1,000ft just as we’d be crossing the far end of runway 07 (and we’d converge to make a big pile of airplane pieces in the middle!). 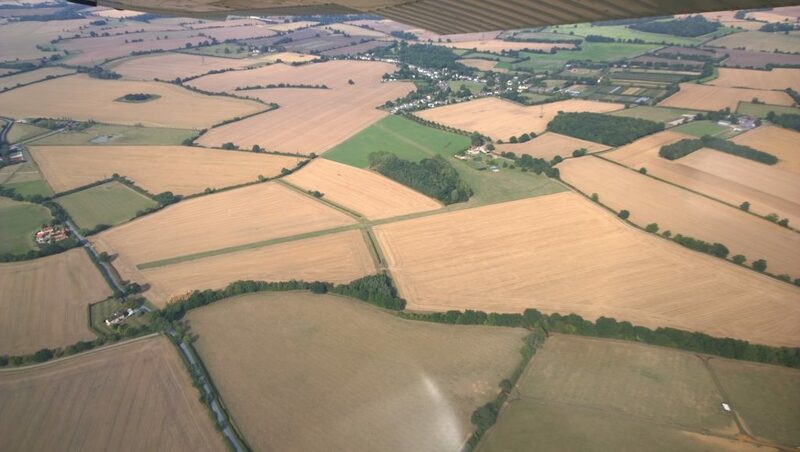 I made sure to report we were cross-wind so they knew to be keeping a good eye out ahead – with only a ground radio in operation (thus not allowed to give any clearances to either plane), we were both flying entirely visual rules and while the rules of the air put me in the right. I’d rather not be having that debate. 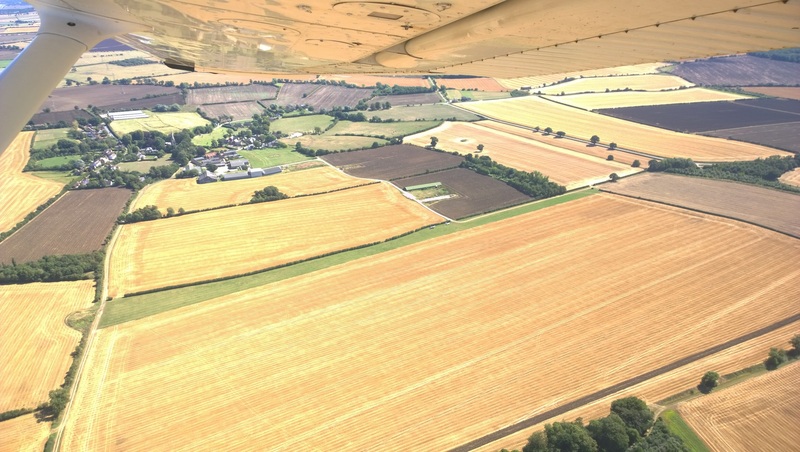 Attleborough was easier to fly around then I’d anticipated and once the other plane was safely behind us in the circuit pattern it was all smooth. More than could be said for my landing, it was on the back wheels nicely but I used about 100ft more then I’d have liked, so I put the wheels down hard. This made us bounce a tiny bit, but nothing that risked the nose wheel – by the time I’d even processed it the back wheels were down again and I could lower the nose. 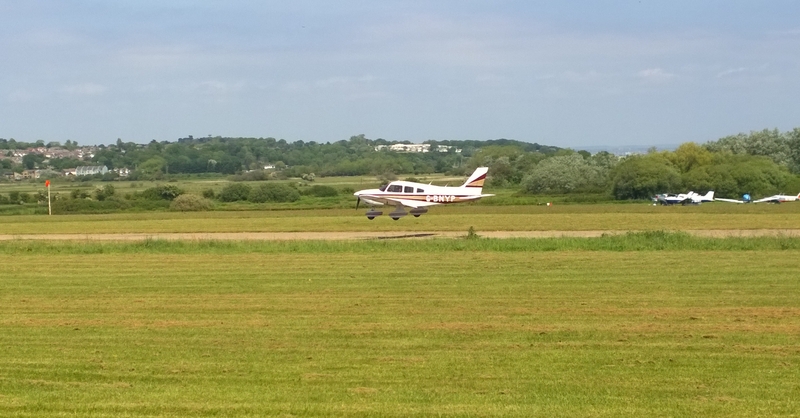 G-MEGS was right down to taxi speed with runway to spare for the 25 taxiway, with a plane behind us I was quite happy with how that’d had gone for a first visit. When we’d left Cambridge, there’d been a guy stood outside with a radio scanner – I’d chatted to him a little. 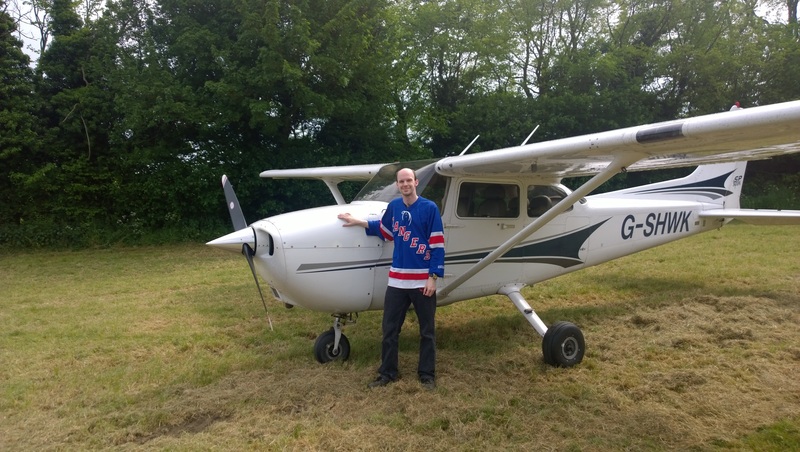 He was a plane spotter, a little strange I’d thought, for sure a lot of big, fast and cool stuff fly’s into Cambridge – but you need to know WHEN! Without local knowledge you could easily burn a week there drinking coffee and watching nothing but Cessna’s and small/medium mass produced jets. For me, that sort of traffic isn’t worth “spotting”. I assumed he must know something I didn’t, but whatever it was, he wasn’t offering it up. For me if you want to plane spot, go find something rare! Something like the 7 cylinder 220hp, Boeing Stearman perhaps! 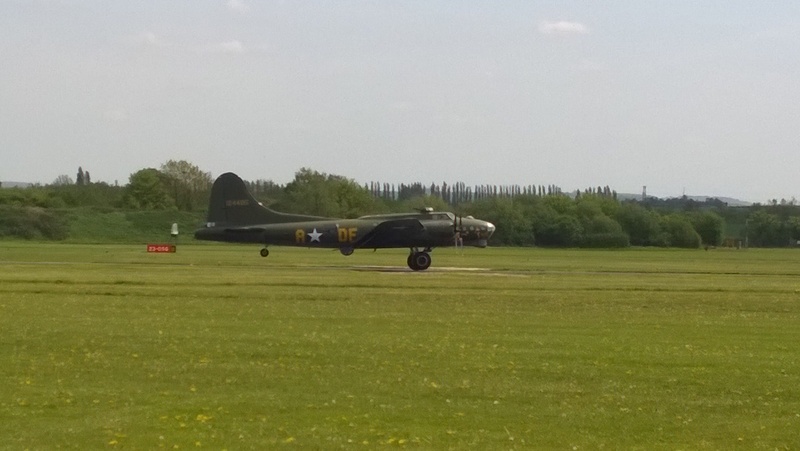 Loads of other cool stuff to see at Old Buckenham a great little airfield to go visit. 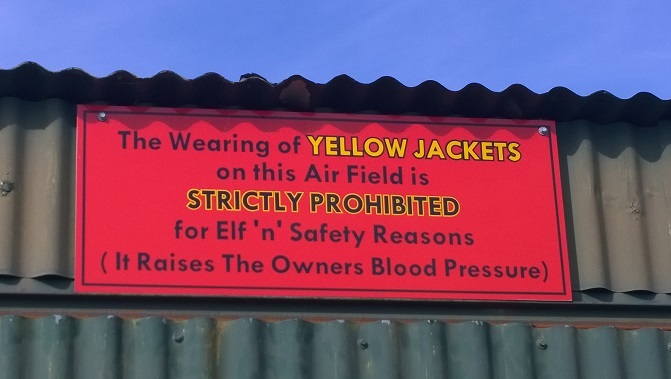 And if I can give you only one tip of advice about going to small airfields, pretty much anywhere in the English speaking world at least. It’s this, try to have a look in the surrounding hangers and/or ask around and see if anyone there is willing to show you what’s behind the doors – I promise you 99% of aviation people are amazingly friendly and love nothing more then to show you something cool they’ve got and have a bit of a chat about it! 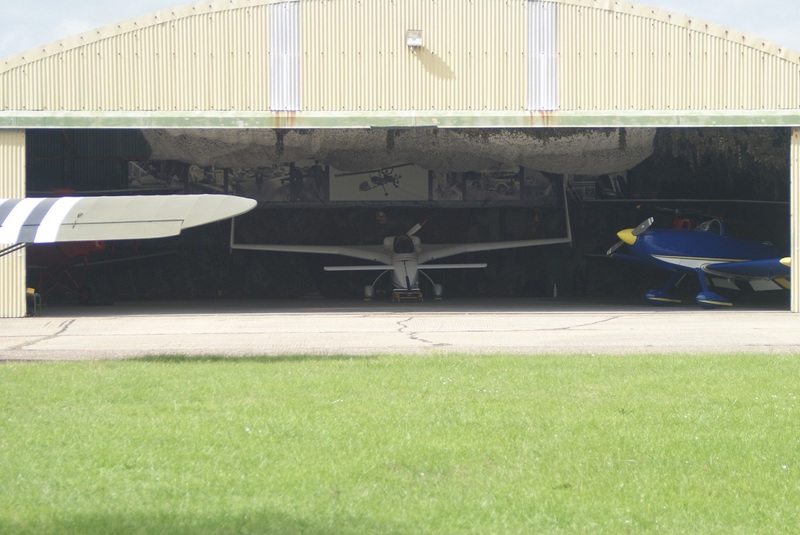 Honestly, give it a go, you’ll be stunned what you can find behind the closed doors of some really simple looking barn type hangers at small airfields. A coffee and a real good look around later, time to jump back in the plane and crack on with a “long way round” trip back to Cambridge. 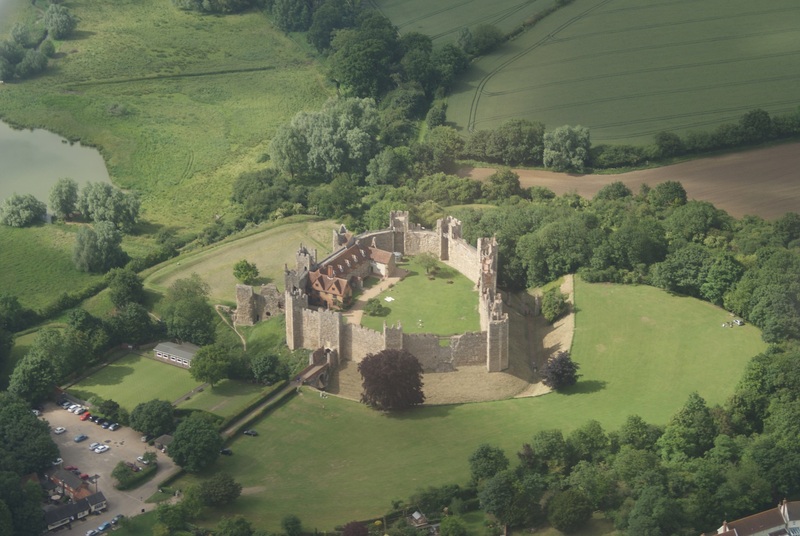 We had the plane all day due to the weather earlier in the day and Framlingham is cool to see from the sky (it has a castle). 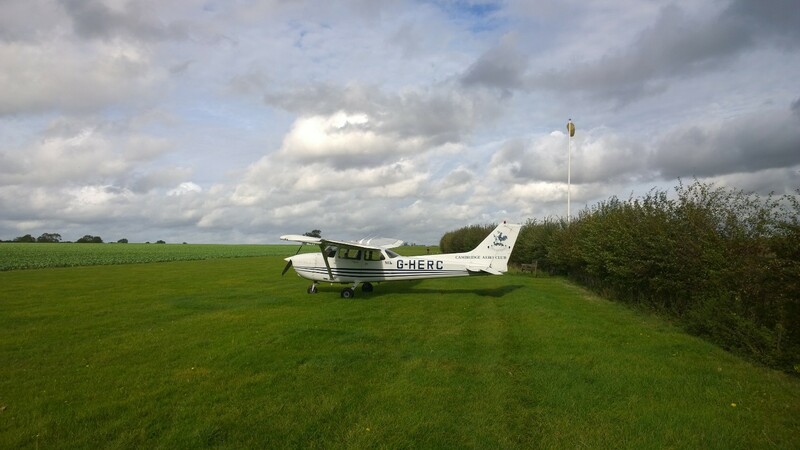 The trip back was pretty uneventful really, we stayed with Old Buckenham Radio until Diss and then switched over to talk to Wattisham Approach to get the ok for going through their MATZ on the way back. 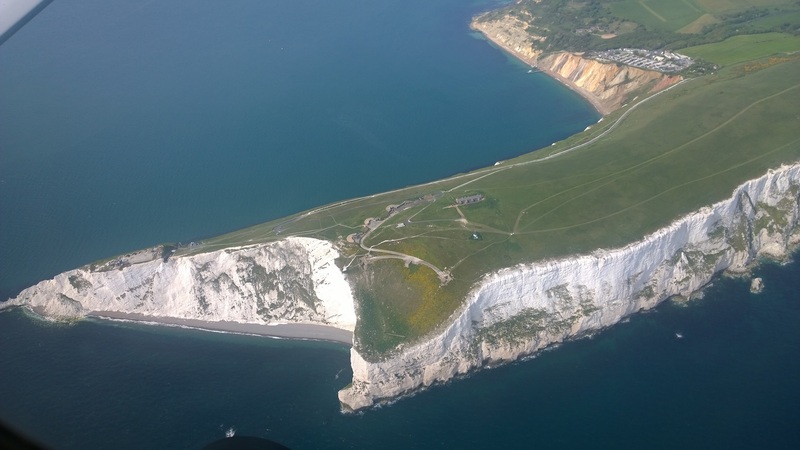 Dropped down to around 1,500ft to get a really good view of the castle and flew around its perimeter just to keep it all nice and safe should we have got hit by an engine failure etc. 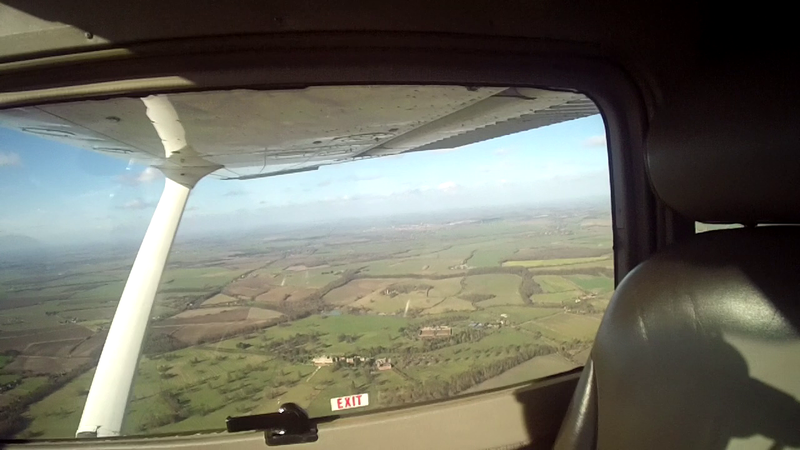 Then it was simply a matter of pointing the plane west for Cambridge and head on home. 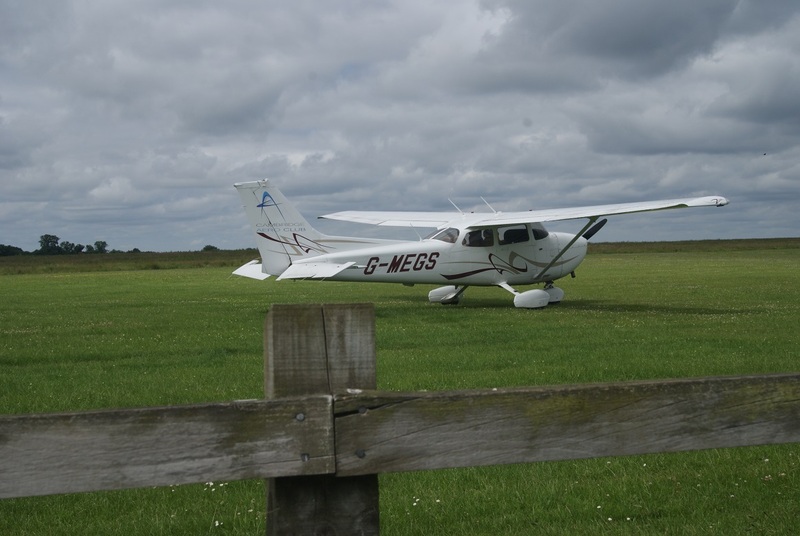 G-MEGS : Traffic at 2,000ft. 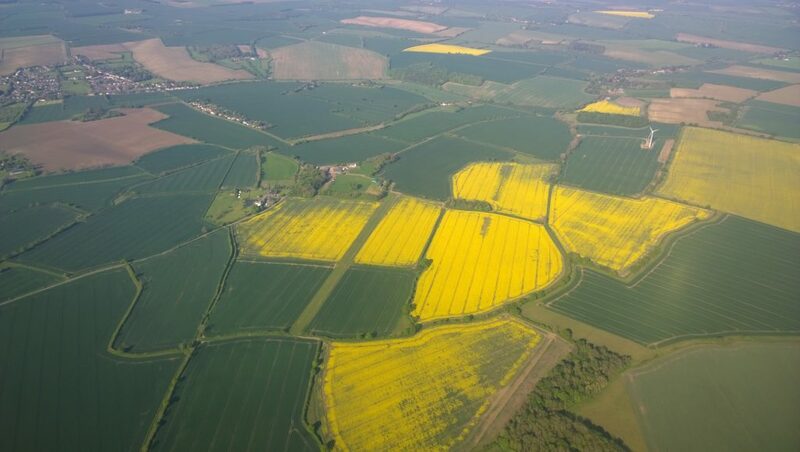 Approx 6 Miles East of Cambridge. This is not what you want to hear – ever, the converging part being the real kicker to the situation. Initially I asked for an overhead join, but as it was the early evening I thought I’d try my luck and asked ATC if it’d be possible to get a Right Base join for 05? This would allow us to simply fly straight into the last leg of the circuit, turn right and land (taking about 5-10 minutes off the circuit). 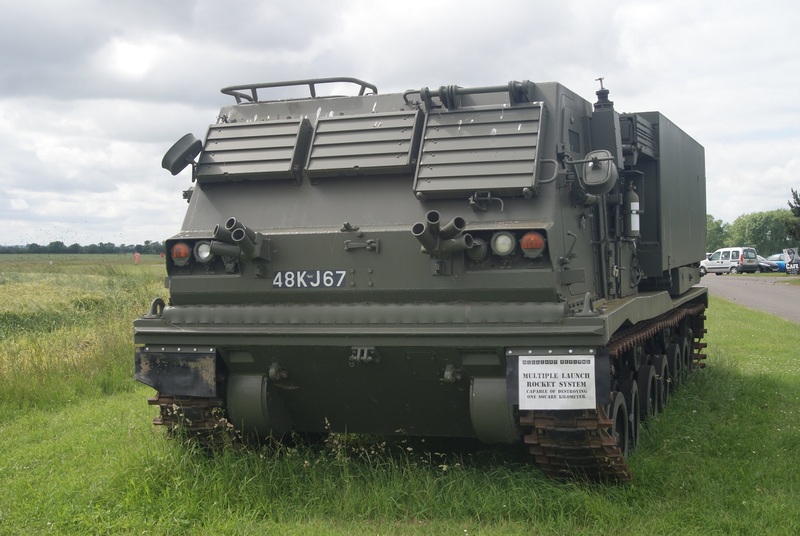 A great day out and beyond Old Buckenham being a good airfield to visit with all the military hardware to have a look around etc. from a flying perspective actually a really quite scenic little route to remember. It may take weeks to get your license, even once everything is signed off. 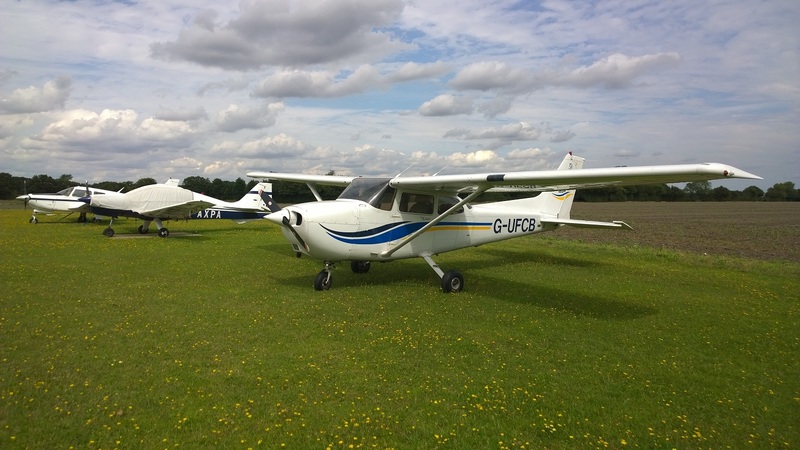 Thankfully the aero club runs a policy whereby if you trained with them, then once they’ve signed everything off and your license is effectively “in the post”, you can fly solo without instruction/checkflight before every trip – but you can’t take passengers. 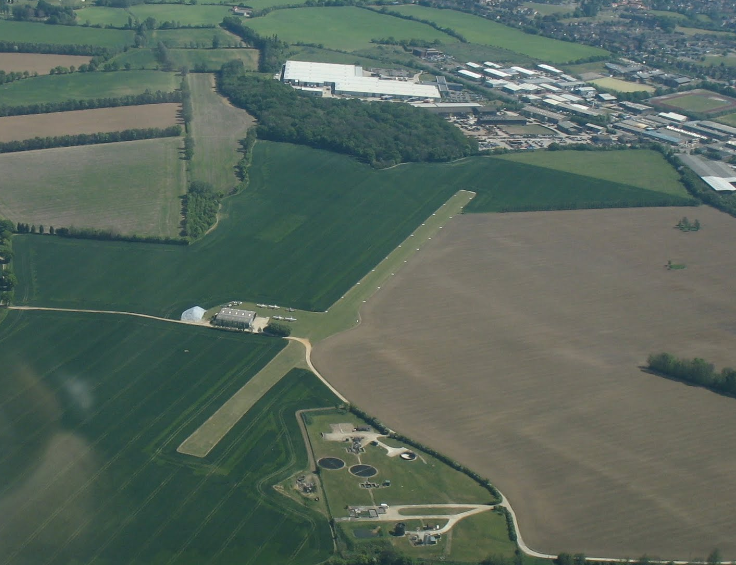 Duxford : Maybe / Maybe Not / Maybe……Maybe Not. 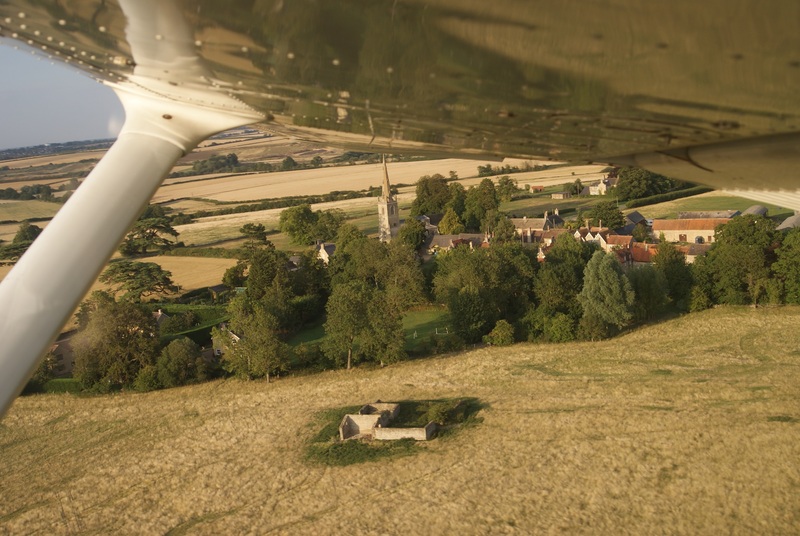 I took them up on this policy, planning a short hop of a trip out to Duxford – the intent to do a local, land away. On arrival, this was a bit of a tricky issue, with new instructors, a degree of confusion set in about whether I was allowed to do this or not. Not helped by a Chinese whisper effect occuring regarding if I had a medical or not – what I’d said is I didn’t have my license or logbook, but had my medical. This became “I didn’t have a license, medical or logbook”. Anyway, eventually we got there and the flight was on. A quick tweak to the route (i.e. 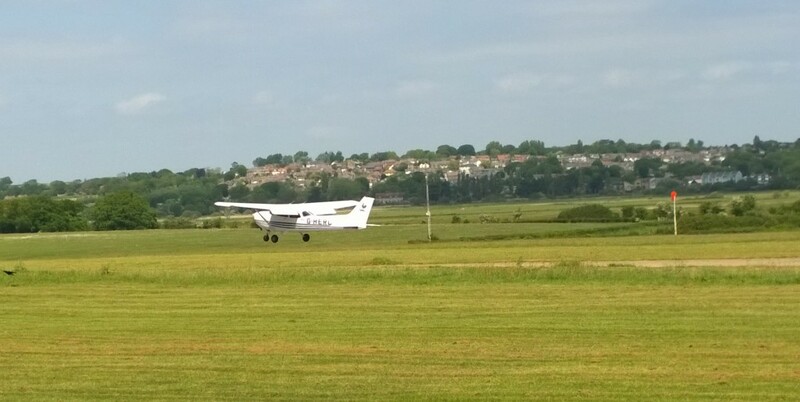 cut out the landing bit) and the flight was back on. The green line is the outward route, the blue line the return route. 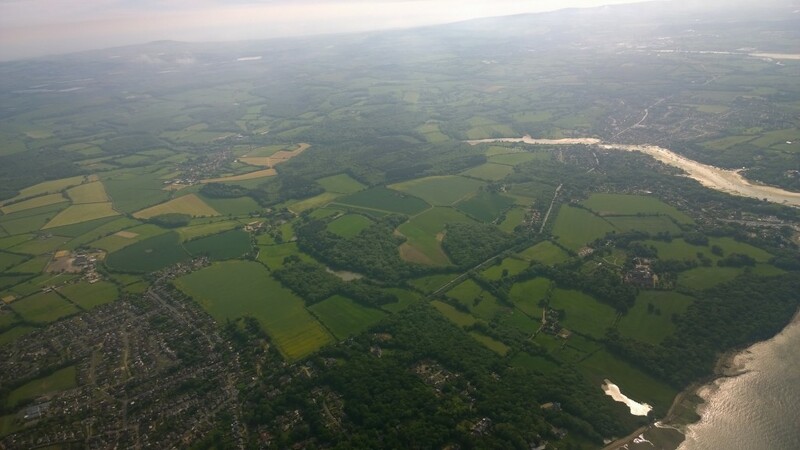 So instead of flying the last leg of the route out, I’d just turn around at Royston, point the plane back to ‘Point Alpha’ and head home. 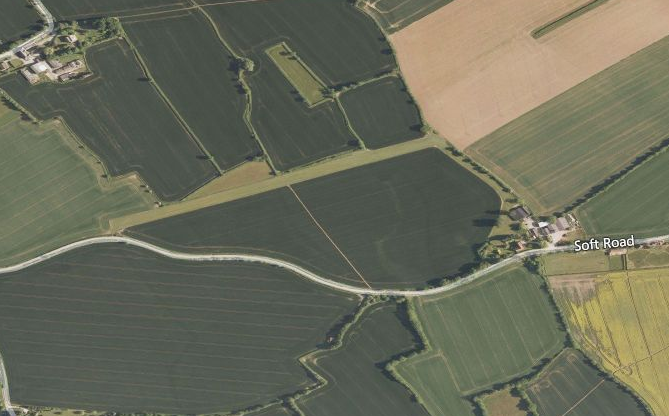 Having only been down in this corner of the map once or twice in training, I’d always wanted to go back as there are a few nice land marks to see. The radio telescope and a few minutes further south west, Wimpole Hall. 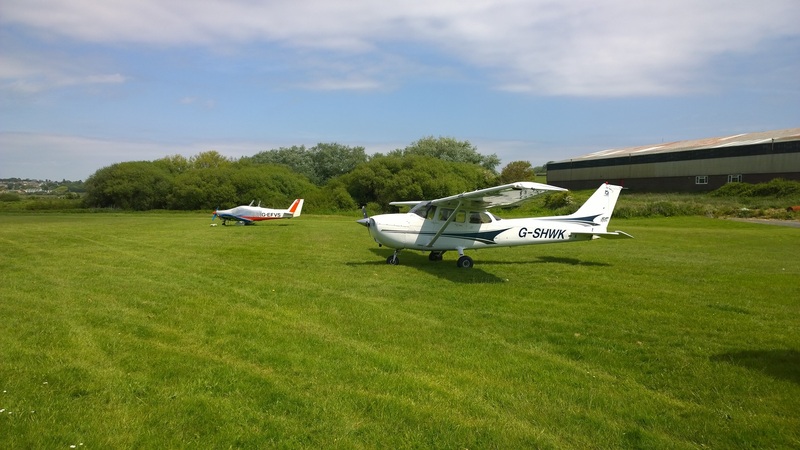 A really nice day to go flying, good visibility, very few clouds and seemingly nothing else up in the air trying to borrow the same real estate. The radio seemed to suggest otherwise, but just not in the area I was flying. 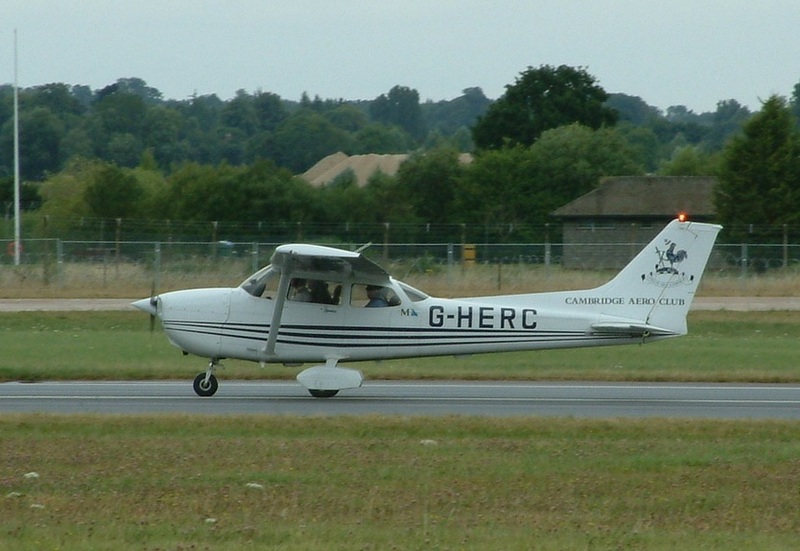 It took 15 minutes to get off the ground at Cambridge with the power checks etc, the flight itself would last just 20 minutes with another 10 to get back into the circuit and land – but as short trips out go. 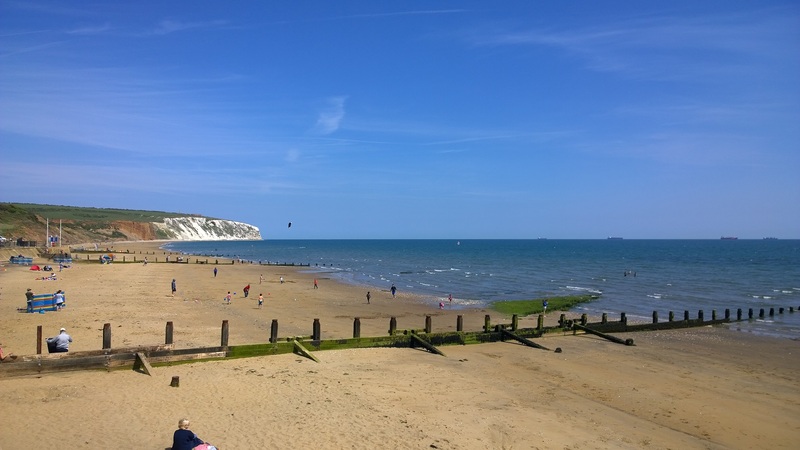 A nicely scenic one, a little bit of nav, but no risk of really getting lost – so a nice trip out given the current licensing position. 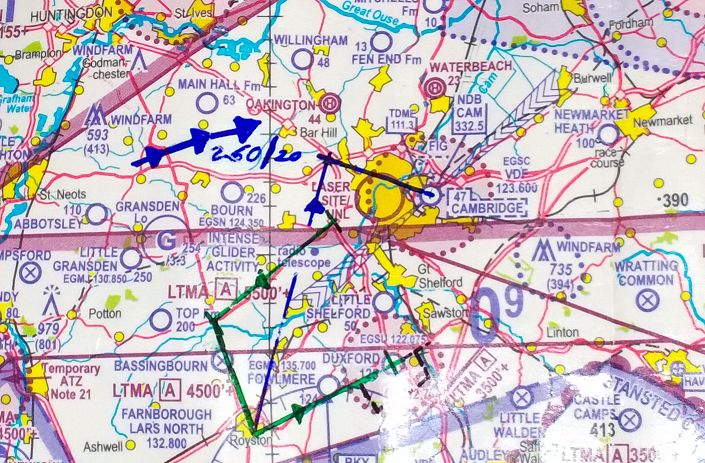 Plus a chance to try something a little different, start the nav from a different landmark, instead of flying straight for Point Alpha (M11/A14 junction) and starting from there. 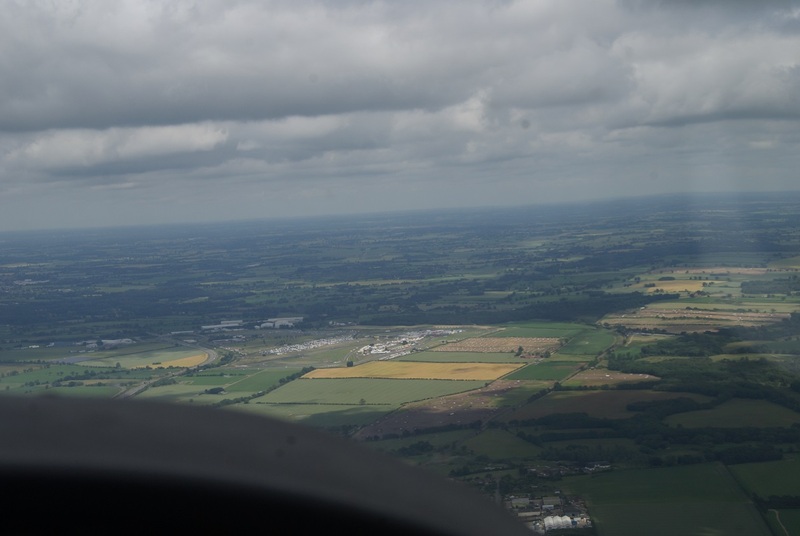 It’s a shame Duxford was closed, I was feeling very aware that since my QXC I’d clocked up maybe 8+ hours of flying without having landed anywhere else but Cambridge (could I remember how!?!?). Those sorts of crazy thoughts begin to creep into your head. Maybe next time. 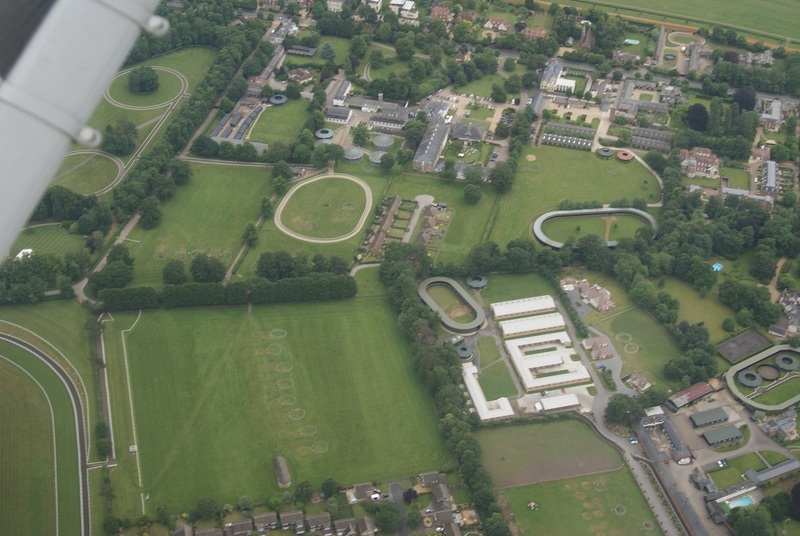 Getting back into Cambridge was easy enough, a police helicopter was operating in the area but that didn’t add too much of a complication to anything. Air Traffic obliged my request for a crosswind join and the landing was pretty good, ending a very nice flight the right way. 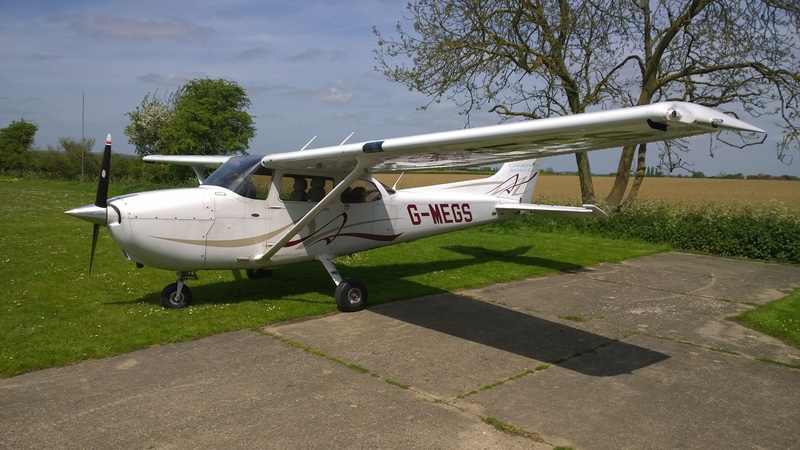 A fantastic little trip out, now for that license to show up so we can take passengers for the first time.